Becknell was born in Virginia in about 1787. He first appeared in the Boon’s Lick country of central Missouri in April 1812 when he joined the US Mounted Rangers. By 1815, he had become involved in a series of business ventures including the salt trade and a ferry service across the Missouri River. In 1817, he established a residence in Franklin, Missouri. The Panic of 1819 cost Becknell dearly. Unable to repay personal loans he had taken out, Becknell was arrested on May 29, 1821, but was released on a $400 bond. By the summer of 1821, the 34-year-old frontiersman had accumulated a debt of $1,185.42 owed to five creditors, and he faced the prospect of prison. On June 25, 1821, prior to official news of the change in government in Mexico, Captain William Becknell placed an advertisement in the Missouri Intelligencer, looking for men to accompany him on his trading venture westward. The stated purpose of the proposed expedition was the trading of horses and mules, presumably with the Indians, and the catching of wild animals. Members of the expedition were to provide their own equipment and an equal part of the capital for the trade. The men met and elected Becknell to lead their expedition. The August 14, 1821 edition of the Missouri Intelligencer reported that 17 men assembled at Ezekiel Williams’ cabin and set September 1, 1821, for the party to cross the Missouri River at the Arrow Rock ferry. Still contested is whether Becknell anticipated the opening of the Mexican border to legal trade or whether he was the benefactor of circumstance, having originally intended to trade with American Indians. Becknell would have been aware of the Mexican declaration of independence in February 1821 and the Mexican revolt against the Spanish prior to his departure. Not until September 27, 1821, however, did Mexico legally divorce Spain, yet the Becknell party crossed the Missouri River above Franklin and departed from the natural landmark known as Arrow Rock on September 1, 1821, as planned. The party crossed the Arkansas River in the vicinity of Walnut Creek then followed the south side of the river into Colorado where they followed the Purgatoire River and Chacuaco Creek southwest, entering New Mexico through Emery Gap. Becknell and company, after an uneventful trip, met a troop of soldiers from Santa Fe on November 13th. They traveled with the soldiers to San Miguel del Vado and into Santa Fe where Governor Facundo Melgares greeted them warmly. Becknell’s timing was advantageous – he and his trading party arrived in Santa Fe on November 16, 1821. Their trade goods, including calicoes and domestic printed cloth, sold at high prices in the isolated Mexican outpost. Having experienced the profits to be gained by this type of trading venture, Becknell was anxious to return to Franklin and to prepare an even larger volume of goods for his next trip to Santa Fe. To this end, he departed Santa Fe on December 13, 1821. The successful Becknell arrived in Franklin on January 30, 1822, after only 48 days travel. William Becknell was the first American trader into Mexican Santa Fe by only two weeks. Soon after Becknell, Thomas James, who viewed Santa Fe as a market for textiles, arrived on December 1st. Hugh Glenn and Jacob Fowler, both trappers and American Indian traders from southeast Colorado, departed for Santa Fe on January 2, 1822. Enormous profits were to be gained for the effort expended and the risk taken by traders participating in the Santa Fe trade. Due to the opening of trade relations between the United States and Mexico and the extreme profits from Becknell’s first successful trade expedition, other expeditions were organized almost immediately, and the Santa Fe trade was initiated. Becknell set off on his second trading mission with 21 men and three wagons, embarking from Franklin, Missouri on May 22, 1822. Another trading party, led by John Heath, left after Becknell but soon caught up with his entourage, so they traveled together to Santa Fe. Some scholars contend that this expedition signaled the first transportation of goods to Mexico that was intended for civilian, not American Indian, trade. 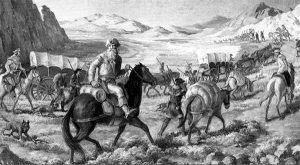 This was the first American attempt to use wagons in crossing the plains since Becknell’s first trip utilized only pack animals. 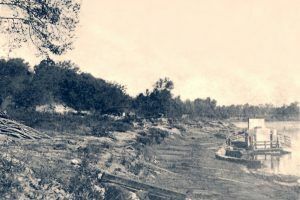 The use of wagons required the party to adopt a trail route that avoided the mountains; this new route partially followed what became the Cimarron Route. Although more strenuous due to the scarcity of water between the Arkansas and Cimarron Rivers, the Cimarron Route was shorter and much less rugged than the later Mountain Route through Raton Pass. Wagons could easily traverse the new route, where scaling the Mountain Route proved treacherous. On his 1822 journey, Becknell and party crossed the Arkansas River in Rice County, Kansas then followed the south side of the river for eight days before heading southwest into Spanish country. 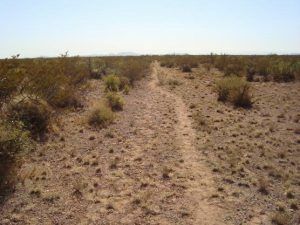 Employing the Cimarron Route also meant the crossing of La Jornada (Spanish term meaning “the journey”), a 60-mile waterless portion of the route where high temperatures usually prevailed. 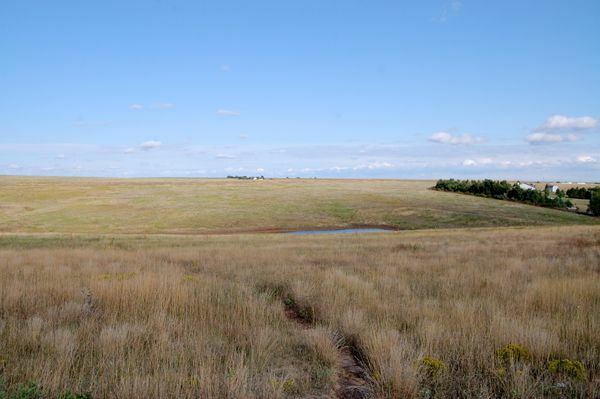 Josiah Gregg, author of the book Commerce of the Prairies, suggested that Becknell’s second expedition was closest to failure on this portion of the Santa Fe Trail; Gregg’s father, Harmon, was a member of Becknell’s expedition. By late July 1822, Becknell was in San Miguel, New Mexico. After continuing on to Santa Fe, he returned to Franklin, Missouri in October 1822. Becknell’s second trading party brought $3000 worth of trade goods to Santa Fe, and the party enjoyed the rewards of a 2000 percent profit on their investment. The demand for American and European goods was emphasized by the instance of Becknell and others selling even their wagons, worth $150, for $700. The profits derived by Becknell from this trip went a long way toward pacifying his creditors back in Franklin. Several other trading parties were assembled quickly with a view to trading with the Mexicans. Colonel Benjamin Cooper and 15 men left Franklin, Missouri with a trading party in early May 1822. Like Becknell, Cooper took the Cimarron Route, encountering hard times when they reached La Jornada. The problem arose when the trading party expended its water supply. They were forced to kill their dogs and cut the ears of their mules in order to have hot blood to drink to survive under the extreme weather conditions. On the verge of abandoning the expedition, they chanced upon and killed a buffalo. They utilized the stomach water from this animal to quench their thirst, and subsequently found water in the vicinity, as had the buffalo. This trail incident was once believed to have happened to Becknell’s party, but it is now believed to have actually happened to the Benjamin Cooper party in 1823. Cooper’s party was forced to return to Franklin after their horses strayed from their camp one night. Even then, the handful of men that were sent out after the horses were robbed of their guns, clothes, and six of their horses by Osage Indians. James Baird and Samuel Chambers, imprisoned ten years earlier for illegal trading, also led an expedition to Santa Fe in the autumn of 1822. The Baird-Chambers trading expedition experienced a severe snowstorm, which forced them to spend the winter in camp near the Arkansas River. When spring came, the traders had no means of transporting their goods since most of their draught animals had perished in the winter cold. The traders cached their commodities on the north bank of the Arkansas River and went to Taos, New Mexico where they purchased mules and returned for their merchandise. The place where the traders hid their goods became known as “The Caches” and was an important mile-marker and campsite for future travelers.